Kevin Smith never stops working. A few days ago, he shared a look at the script for his third episode of The Flash and now he's giving fans a tease of his next project: a show for the History Channel. 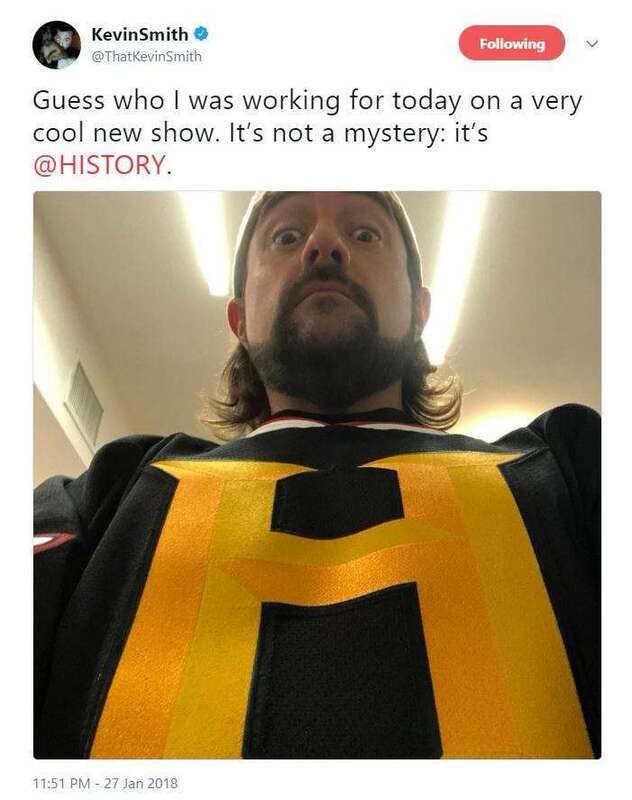 The filmmaker took to Twitter to share a photo of himself in a hockey jersey with the History Channel's "H" logo on the chest, announcing that he was working on a project for them. "Guess who I was working for today on a very cool new show," Smith wrote. "It's not a mystery: it's @HISTORY." Smith gave no additional clues as to what the show would be about but given his well-known love of comic books and deep involvement with them it wouldn't be too far a stretch to speculate that the project may be comics-related. Smith has written for both Marvel and DC Comics over his creative career, though he may be best known for his 15-issue run on Green Arrow during which he created the character Mia Dearden among others. Smith has also been deeply involved in comic book television as well, directing three episodes of The CW's Supergirl and The Flash. He also appears in and produces the reality series Comic Book Men for AMC. Of course, the series could also be about a broader topic, like movies. Smith is also passionate about movies and is vocal about his thoughts on a wide range of films, from the Marvel Cinematic Universe offerings to Star Wars to even his own work. It's possible that his involvement with the History Channel could even be connected to his current film project, Kilroy Was Here. While Smith's movie is described as horror anthology film, it takes its name from a famous piece of graffiti that dates to World War 2 and features a bald character peering over a fence, his prominent nose hanging down. The graffiti has become a popular cultural expression as well as connections to similar Australian and British expressions prior to World War 2 which could make it an interesting topic for a History Channel project. Whatever the show is, it goes on the ever-growing list of things Smith is working on. Beyond the History Channel project, The CW shows, and Kilroy Was Here, Smith also recently pitched a project to Netflix and is producing a new weekly IMDb series all in addition to his regular podcast projects.